We have been most of the wine regions in California. But Mendocino isn’t one that we have visited…yet. Jim “The Travel Organizer,” who last wrote about Auckland, Oslo, the small German town of Speyer and Deidesheim, Oahu, Napa Valley, Venice, Singapore, Bangkok, Sonoma County and Myrtle Beach, likes visiting wine regions and here are his tips should you visit. “Location, location, location”: You’ve heard this mantra countless times. The first time it appears in print is in a 1926 real estate ad run in the Chicago Tribune: “Attention salesmen, sales managers: location, location, location, close to Rogers Park” (William Safire, The New York Times Magazine, June 16, 2009). This phrase is especially apropos when it comes to California’s “Wine Country” as it focuses one’s thinking on the crucial role of terroir (the French concept of place reflected in the glass) that is so important in winemaking as well as the incredible geographical diversity Mendocino County offers. In this destination report, I hope to take you on a journey back in time to a location sans crowds where wine tasting is still (mostly) free and where the person pouring your wine is likely to be the winemaker or a member of her/his family. Day 1: Drive north on the incredibly scenic Pacific Coast Highway, checking into the lodging of your choice in or near the town of Mendocino. 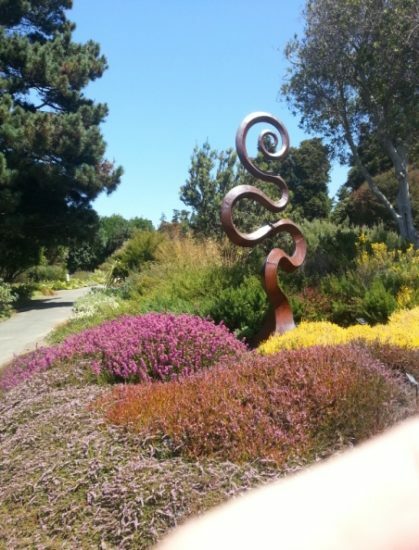 Day 2: Visit the Mendocino Coast Botanical Gardens in nearby Fort Bragg; return to your lodging. Day 3: (Saturday) Visit Anderson Valley wineries between Navarro and Philo; return to your lodging. Day 4: (Sunday) Visit wineries in Boonville and Yorkville Highlands on your way back south. If you fly into SFO, driving straight to the town of Mendocino via the incredibly scenic Pacific Coast Highway (CA State Road 1) would take about 5 hours, not including any stops along the way. 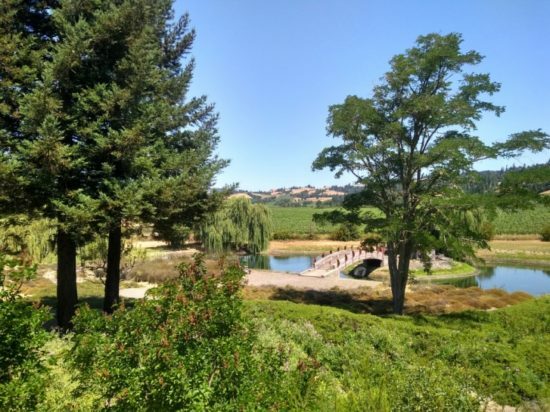 A more leisurely and much more enjoyable vacation would include visiting Sonoma County (where my wife and I owned property for 7 years and where we lived for almost 3) before continuing north. Driving west on Highway 12 to the coast takes you through the hamlet of Bodega (population 220) a setting for Alfred Hitchcock’s 1963 masterpiece, The Birds. Just off the highway, on a hilltop, it’s impossible to miss the 19th century Saint Teresa of Avila Church which was seen briefly in the film and was also the subject for an Ansel Adams photograph. Just behind the church (but difficult to see from the highway), at 17110 Bodega Lane, is the Potter Schoolhouse (now a private residence) where a murder of crows attack a class of children in Hitchcock’s film. After a 7 mile drive to Highway 1, you’ll come to Bodega Bay where you can order a “grilled filet Hitchcock” at the Bay View Restaurant at The Inn at the Tides (also in the film) or continue another ½ mile north to The Birds Cafe (aptly-named) where you can enjoy rich clam chowder. Before leaving Bodega on your way to the coast and lunch, you might want to drop in at the Artisan’s Cooperative Gallery (17175 Bodega Highway/Highway 12). The raku pottery of Randy Snyder is displayed here, along with the work of dozens of other local artists. Just north of The Birds Café is the Ren Brown Collection (1781 Highway 1), offering the largest selection of contemporary Japanese prints in California. After 90 minutes of breathtaking scenery, you’ll come to the village of Gualala, home to numerous art galleries which are worth a stop, should time allow. 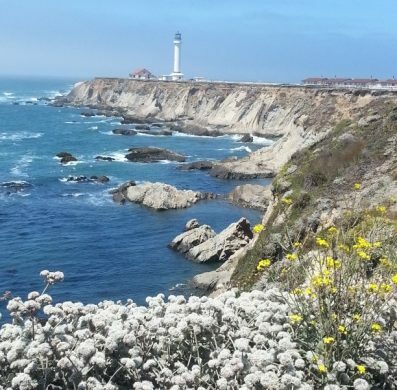 Continue driving north on Highway 1 to Point Arena where you can make a left-hand turn for a quick detour to Point Arena lighthouse, the closest spot in the continental United States to Hawaii. This lighthouse may look familiar because it has also been in the movies: the closing scenes from Forever Young (starring Mel Gibson, 1992) and Need for Speed (2014) were shot here. Plan to arrive in time to take the lighthouse tour (last tour is 3:15pm, 4:15pm from Memorial Day through Labor Day). Just north of Point Arena, you will cross the San Andreas Fault which is noticeable but unmarked. From here, the town of Mendocino is only another hour north. Check into the lodging of your choice and enjoy a nice dinner, preferably with a sunset view. 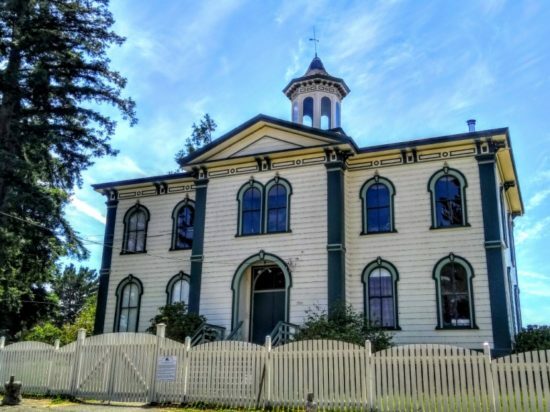 Mendocino, the only town on the California coast designated as a Historic Preservation District, is worth some time. The Kelley House Museum offers highly-rated, docent-led tours for just $10/person on Saturdays and Sundays. If you’re following this suggested itinerary, you will be wine tasting on the weekend; fortunately, the museum has also developed a self-guided, multimedia tour on an Android tablet which you can rent for $10, either at the museum (Friday-Sunday, 11am-3pm) or at the Main Office (Monday-Friday, 1-4pm). Alternatively, you can follow the self-guided tour put together by AAA’s Via magazine (enter “95460” in the zip code field if prompted). After lunch, it’s just a quick 10-minute drive north on Highway 1 to Mendocino Coast Botanical Gardens (MCBG) where Winesong, which has been called “America’s best charity wine event,” is held each September. Botanically speaking, MCBG is best known for its collection of “tender species” rhododendron native to Burma, China and Tibet. Shutterbugs will appreciate that MCBG stays open for photography’s “golden hour” Thursday-Saturday from July to September. You can click on the “What’s in bloom” page of MCBG’s website to plan your visit. If you want to go wine tasting in Mendocino County, the best bang for your buck is to schedule your visit around one of the 5 annual events sponsored by the Alexander Valley Winegrowers’ Association. We recently returned from California after attending the 6th annual Barrel Tasting Festival during which we visited 10 wineries over the course of a weekend. Tickets were just $20 each in advance – less than the cost of a tasting at just a single winery in Napa Valley! 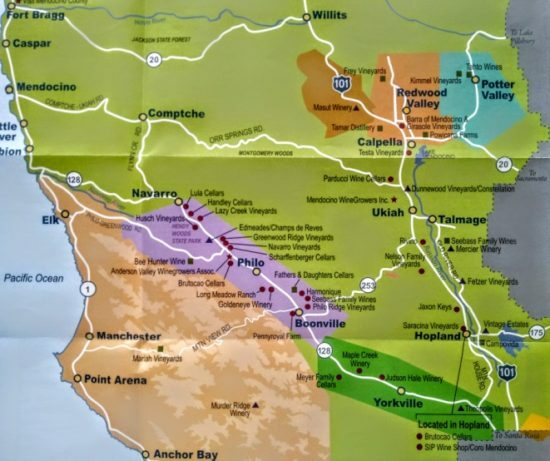 7 minutes south of Mendocino hugging the Pacific coast, you will come to Highway 128 which runs all the way into the heart of Napa Valley and then turns east to the south end of Lake Berryessa and, beyond that, Sacramento. After driving a short 2 miles on Highway 128, you enter the “eleven-mile-long redwood tunnel to the sea” that is Navarro River Redwoods State Park before emerging onto the broad expanse of Anderson Valley (shaded lavender on the map at the beginning of this report). 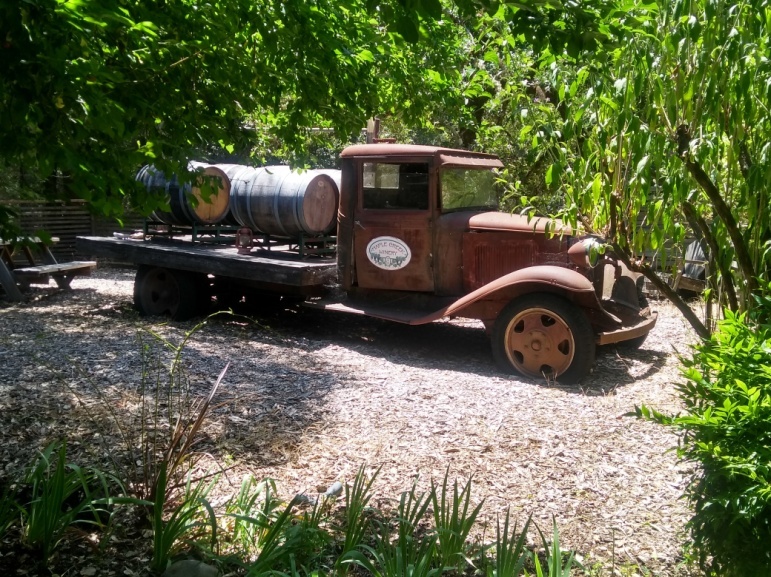 Just 4 miles farther is Lula Cellars, a boutique winery in the storied “Deep End” (the Boontling term for the north end, more about Boontling below) of Anderson Valley, best known for Pinot Noir. The tasting room hosts here have a deliciously dry sense of humor but the wines are seriously good. Their dry Gewürztraminer ($24) has been our “go-to” Thanksgiving wine for a few years now. On our most recent visit, their “Guntly Red” (a blend of Pinot Noir and Zinfandel, also $24) knocked our socks off. Continue 2.4 miles to the landmark octagonal tasting room of Greenwood Ridge Vineyards. Built from a single 400-year-old redwood which fell in a 1969 storm, it was designed by the winery founder’s father who was also an associate of Frank Lloyd Wright. Tip: If you join the wine club here, you’ll enjoy complimentary tasting privileges at 9 additional wineries, mostly in Sonoma County! After 1.6 miles, you will come to Brutocao Cellars’ redwood barn tasting room in Philo (they have another tasting room in Hopland off Highway 101). In a twist of fate, the grandfather of Brutocao’s current winemaker tilled land for the original vineyard purchased by the grandfather of the current CEO in 1943. Another 2.4 miles brings you to Balo Vineyards (watch your speed en route!) If you want to get a sense of the importance of terroir in winemaking, read the “Our Vineyards” page on Balo Vineyards’ website. Return to your lodging for your last night in Mendocino County. Highway 128 in Boonville (population 1,035) is a quintessential small town Main Street. Indeed, there are no traffic lights in all of Anderson Valley except the temporary one you will encounter on today’s drive set up to queue traffic through road construction. One of the quirky aspects of Boonville is that it is where Boontling (“horn of zeese” = cup of coffee), one of only two homegrown languages remaining – now nearly extinct – in the United States, was developed in the 19th century to gossip covertly. Leaving Yorkville Cellars, you will climb 1,200 feet over a ridge on Highway 128 dropping into Cloverdale at the northern end of Sonoma County. From there it is 3 hours back to SFO or you can extend your wine-themed vacation by continuing on 128 into Napa Valley. Tip: WINEtineraries (Editor’s Note: This is the author’s business) knows how to save on tasting fees, which restaurants offer complimentary corkage (saving $10-$25/meal) and can suggest itineraries based on your wine preferences, interests and price sensitivity.